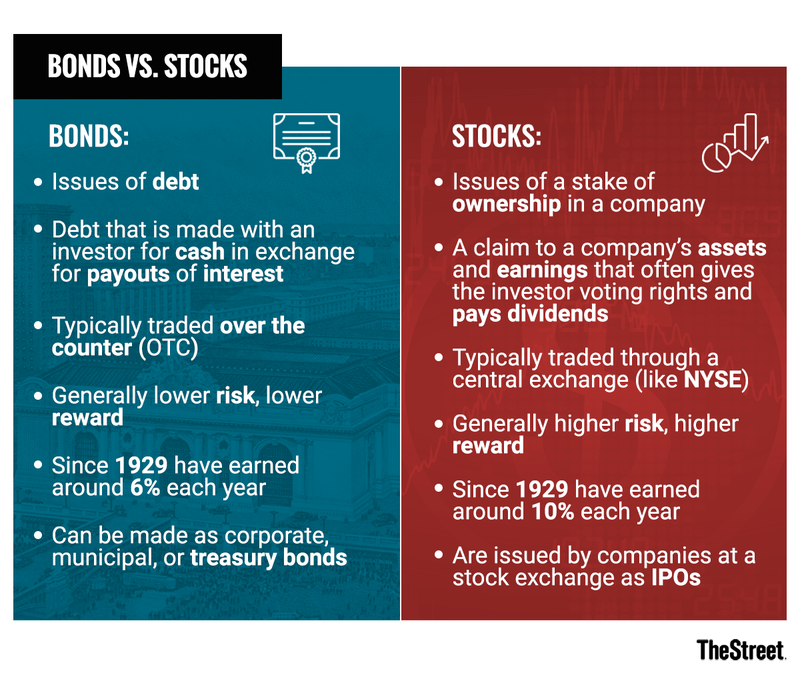 Bonds vs. Stocks: What's the Difference? While a bond is an issuing of debt with the contingency to pay interest for the money, stocks are stakes of ownership in a company that are given in exchange for cash. Ah, stocks and bonds - the heartbeat of Wall Street (and arguably the economy). But whether you trade on the New York Stock Exchange, financial terms can always be confusing. So, before you invest in a stock or a bond, you need to know - what is the difference? And which one should you choose? Bonds are debts while stocks are stakes of ownership in a company. Because of the nature of the stock market, stocks are often riskier short term, given the amount of money the investor could lose virtually overnight. However, long term, stocks have historically proved to be very valuable. On the other hand, bonds often operate off of fixed interest rates that the entity buys from the investor, which will frequently pay out annual interest rates to investors while repaying the amount in full at a given time. For this reason, bonds are generally considered a safer investment in the short term or for new investors. Additionally, stocks and bonds are sold differently. Stocks are sold internationally on different exchanges, but in the United States, stocks are sold at one of the premier stock exchanges like Nasdaq, New York Stock Exchange (NYSE), or the American Stock Exchange (AMEX). All of these markets are regulated and kept in check by the Securities and Exchange Commission (SEC). Bonds, on the other hand, are generally not sold in central exchanges like stocks are - but are typically sold over the counter (OTC). Many experts advise diversifying your portfolio with stocks and bonds to ensure a mixture of high-reward and low-risk. Boiled down, a stock is a stake of ownership in a company that is sold off in exchange for cash. A stock is a security in that company that can also be referred to as equity or a share. When a company goes to sell a stock (companies issuing stock for the first-time issue Initial Public Offerings, or IPOs), they decide to sell a certain amount of shares of ownership in their company that they will give up in exchange for cash from investors. The investors will then have part ownership in the company and will be able to sell or trade their stock (on the stock market) to other investors to make profits (or take losses if the company is doing poorly). Additionally, by buying a stock in a company, the investor buys a claim to that company's earnings and assets. A stockholder's ownership is determined by the number of shares the investor has relative to all outstanding shares. A common example of this is if a company issues 10,000 shares and someone buys 1,000 shares, they own 10% of the company's assets. Stocks often operate off of nominal returns, which express net profits or losses on an investment. For example, if you bought a stock at $100 per share and sold it at $120 per share, you would get a nominal return of $20. Companies can pay out profits to investors through dividend checks, typically paid quarterly. However, not all profitable companies pay dividends. Still, according to Time Money 101, since 1928, stocks in general have earned around 10% each year, compared to bond's 5% to 6%. Stock is bought on exchanges like the New York Stock Exchange, the NYSE, or Nasdaq. Stock is typically traded through a brokerage firm and entail fees. You can learn more about how to trade a stock here. The two main types of stock are common and preferred. Shareholders with preferred stock will receive payouts and dividends before those who own common stock in that company - basically, those with preferred stock have a higher claim on the company's first asset payouts, leaving common stock holders with no guarantee of payment. Those who own common stock in a company typically have voting rights in shareholder's meetings and may even receive dividends, while preferred stock owners do receive dividends but don't always receive voting rights. Preferred stock owners also typically have priority if a company goes bankrupt. Learn more about the difference between common and preferred stock here. The biggest pro of investing in stocks over bonds is that, history shows, stocks tend to earn more than bonds - especially long term. Additionally, stocks can offer better returns if the company growth is exponential, earning the investor potentially millions on an originally miniscule investment. For investors willing to take the risk, stocks can pay more than bonds in returns as the company's stock could continue rising. Still, stocks are not always the best option. As a con, stocks make no promises of future returns on initial investments. Because the stock market is unpredictable, it is very easy to lose money by investing in the wrong stocks. For this reason, stocks are often considered higher risk than bonds. While stocks are a stake of ownership in a company, a bond is a debt that the company or entity enters into with the investor that pays the investor interest on that debt. Essentially, bonds are IOU's that companies enter into with investors on the pretense that they will repay the money lent in full with regular interest payments. However, bonds can be issued by a company, a city, or a government (in the case of government bonds), and are generally considered a lower-risk option compared to stocks. Bonds are created when a company, government, or other entity wishes to raise money to finance a project, growth, or development and wish to use investors instead of a bank to create loans. Bonds are fixed-income investments, which operate off of a fixed interest rate and a fixed amount of time wherein the company, government, or other will repay the money plus the interest (the interest rate is called a coupon rate) to the creditor (at the point of maturity). For this reason, bonds are frequently called "fixed-income securities," which, as the name suggests, may be more dependable (in theory) than investing in stocks. For example, if you have a fixed-rate coupon bond (which pays the same interest rate over time) at 5% at $10,000 par value, you would receive an annual $500 in interest as the bondholder. And, even if interest rates across the board drop a percentage or two, the bond coupon will rest at 5%. Bond yields come as coupon yields, which expresses the annual interest rate that was fixed when the bond was created. It is expressed as a percentage of the original investment and doesn't change over time. Current yields, however, are the bond's coupon yields divided by that bond's market value (or price), according to the Financial Industry Regulatory Authority. While bonds may be traded through exchanges, as corporate or government bonds often are, they are commonly traded over-the-counter, or OTC. In contrast with stocks, as a pro, bonds are often lower risk due to how they have fixed coupon (or interest) rates on their loans. Additionally, fixed-rate bonds can be resilient to changes in interest rate fluctuations in the economy, making them a desirable asset to own in uncertain times. However, as a con, bonds don't have as much income potential as stocks - the latter of which can multiply in value overnight (conceivably). When investing in bonds, it is important to first decide what type of bond you want - the main kinds being corporate bonds, municipal bonds, or treasury bonds. As with any investment, a vital step is researching different kinds of bonds and choosing one that is right for you and your financial situation. You can learn more about buying bonds here. A majority of investors will use stock brokers to buy stock in the stock market. Popular firms to use include Charles Schwab (SCHW - Get Report) , Citigroup (C - Get Report) , E-Trade (ETFC - Get Report) or Ameritrade (AMTD - Get Report) (the latter two are electronic brokerages). When buying stocks, it is important to be informed about the stock market so you can make the wisest investments. Learn more about how to invest in stocks here.